What do you think of when I say the word "warm"? How about the word "sweet"? How about the word "fun"? Why didn't we all share the same ideas for those words? Who heard someone else share an idea that you've never heard of, or never experienced? Why can we remember some things that happened to us when we were just three years old, but we can't remember what we had for lunch two weeks ago? 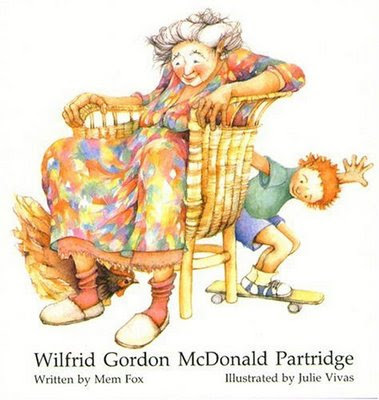 Wilfrid Gordon MacDonald Partridge lives next to an old folks' home, and he knows and loves each person there. That is why he is dismayed upon learning that his "favourite person of all" (note the Australian spelling of favorite) has lost her memory. Wilfrid wonders what a memory is, and begins asking each of the residents of the home. One answers, "Something warm, my child, something warm," while another answers, "Something from long ago, me lad, something from long ago," and so on. Intent upon giving Miss Nancy her memory back, Wilfrid collects items which he feels match the description of memory shared by his friends. (Something warm, for example, is a freshly laid egg). When he shares his collection of gathered treasures with Miss Nancy, she remarks, "What a dear, strange child to bring me all these wonderful things." Then she starts to remember. Each object retrieves from her memory a long forgotten pleasure, such as days at the beach, eggs found in nests, and a farewell to a brother off to war, whom she never saw again. And the final object helps her to recall the day she had first met this sweet little boy, and all the secrets they had shared. Why did each person tell Wilfrid a different answer when he asked, "What's a memory?" What other object could he have collected for something warm? Something that makes you cry? Something that makes you laugh? Why does Wilfrid like Miss Nancy the most? (She has four names, just like him). How else are Wilfrid and Miss Nancy alike? 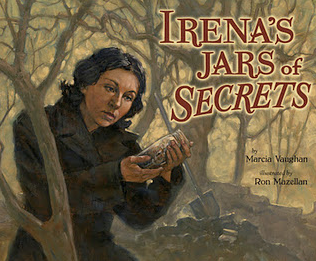 A day or two before sharing the book, ask each child to bring in a small object that holds a special memory for them. Have students write a short paragraph describing that memory. These can be shared aloud, or all of the objects can be displayed, and the teacher can read each description aloud (omitting the name of the object) and students can guess which object matches each description. Students can create simile poems describing favorite places. The ocean might be described as "salty as a pretzel," and the sand as "blinding as a light bulb." Or , the simile poems can deal with opposite sides of each student's personality. A student might write, "At school I am as quiet as a mouse, At home I am as loud as a tornado." Students can interview parents, grandparents, older uncles and aunts, or residents of a senior citizen's home. They can ask standard questions about favorite memories, or, keeping more in line with the book's theme, students can ask, "What was something warm you remember from when you were a child? What was something that made you laugh?" and so on. Conduct a memory experiment using Kim's Game. Second, inform students that once the cloth is lifted they will have thirty seconds to look at (but not touch) all of the items on the table. They are to then go back to their desks and individually create a list from memory (and the tablecloth is again placed over the objects). Younger students might be paired with upper grade students or parents who can record their items quickly (and help recall them as well, if desired). Third, take a quick survey of how many items each child could recall. If the lists seem especially short, the teacher might provide memory-prompting questions such as, "Were there any items that were silver? Did any of the items have numbers on them?" These prompts can later lead to a conversation of how and why scientists categorize things into groups (reptiles, birds, mammals, etc.) based upon common criteria. Fourth, (and this is important!) have students draw a thick, dark line under the last object on their list. Then, tell students that they will now be placed into groups. Each group can share ideas, and students can add to their lists if they agree. Fifth, after some time sharing in groups, get together and debrief: "How many total objects could your group list? There were actually ___. Raise your hand if your group got at least ___. Great! Raise your hand if your group helped you to add some items which you couldn't remember. What does that tell us about working together? Now, let's see if we can recall what was under that blanket. Let's start with those objects I mentioned earlier, that had numbers on them. Who can tell me what they were? (watch, ruler, playing card) How about objects that were black and white, with no other colors? (domino, dice, Oreo cookie) And so on. Sixth, ask, "If we did this activity again, what could we possibly do so that we could remember more of the objects once they're covered up again?" What's fantastic about this activity is that it introduces, in a very concrete manner, scientific behaviors including hypothesizing, observing, recording, communicating, classifying, confirming, evaluating, and drawing conclusions. This was amazing! I have just started a blog on children's books. I am not a professional just a mom who's children enjoy books. I will definitely be taking advantage of your blog! Best of luck with your blog! The difficulty is in choosing from all the thousands of fabulous books out there!